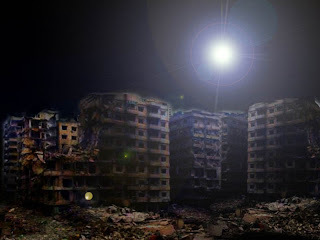 The earthquake was followed by a boom in UFO sightings, but sixteen cases occurred on the night of the tragedy alone (some of them accompanied by significant visual material) which have been subjected to study by UFO researchers. Researcher Rodrigo Fuenzalida told Publimetro that the highest concentrations of reports appear to be Las Condes, Peñalolén, Providencia and Colina. "We have eyewitness testimony from a couple that refused to sleep in their apartment on the night of the earthquake, choosing instead to spend the early morning hours in the street. They were able to see an object that looked much like the moon, but immediately realized that the moon was on the other side. This event may have been seen by residents of other communes," said Fuenzalida. Another major sighting took place on Isla Robinson Crusoe, part of the Juan Fernandez Archipelago, where people witnessed an object emerging from the sea shortly before the earthquake. Regarding the case involving a humanoid -- reported by passengers on a bus in Iquique -- Fuenzalida notes that while startling, he is aware of other similar cases, but people "do not dare report them, fearing that they will not be believed. "I've heard of the manifestations of these "luminous men", said the ufologist. "We are in an ideal period for sightings. I would ask everyone to be alert, but be mindful to avoid confusion, or a state of hysteria."